Great-great-great-grandfather, William Bryan Robbins, Sr.
Taken at the home of his Great-grandfather Robbins in Stevens Co., Washington. Earlier this month, I spent time with extended family and friends at my parents' place for their annual Fourth of July barbecue. My 20-month-old grandson, Theo, attended with his parents, my daughter and son-in-law. It was Theo's second Fourth of July at his Great-grandpa and Great-grandma Robbins' property high in the Selkirk Mountains, and this time he was big enough to run around. And run around, he did. They say it takes a village to raise a child. It took almost that many to keep an eye on a busy toddler that loves to explore: his parents, his three cousins, and me. Occasionally, he would come across something that would capture his attention, and he would hold still for a few minutes. One of those items was the polar bear statue of my great-grandfather, William Bryan Robbins, Sr. I have written about Bryan's service with the American North Russian Expeditionary Forces in a series on this blog, and it is the statue I reference in the first post in that series. When my dad was a boy, he and his father came across this statue at a nursery. Grandpa decided it would make the perfect gift for Great-grandpa, as a way to honor his military service. 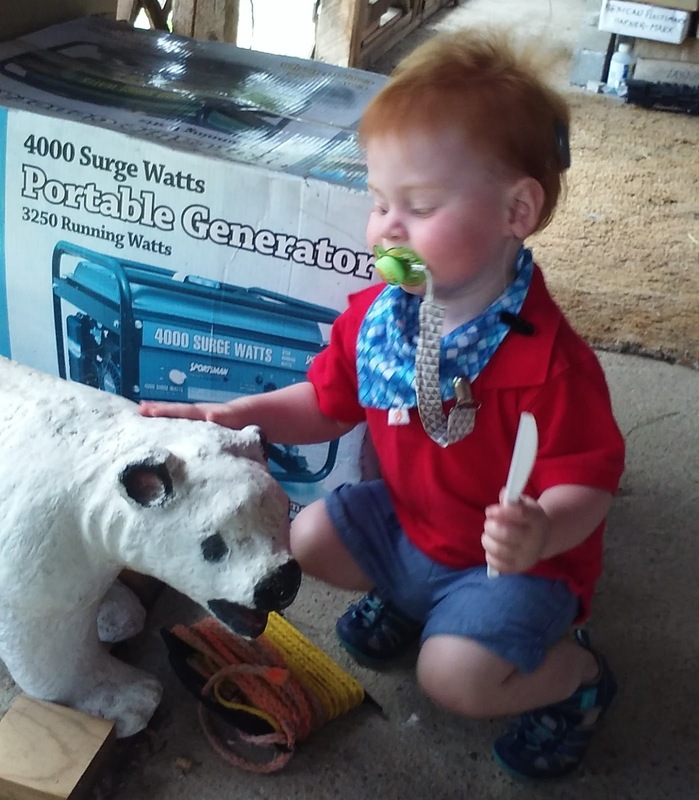 I wish I could have captured the look on Theo's face when he spotted Great-grandpa's polar bear. His eyebrows rose, his mouth opened wide (so that his binky fell out! ), and then he ran to squat and pet the bear. ...the stories that motivated me to begin genealogical research; the stories that motivated me to write down my ancestor stories, or AnceStories. When my great-grandfather died in 1972, he had known seven generations of Robbins in his lifetime, from his great-grandparents, to his grandparents, parents, siblings and cousins, children, grandchildren, and great-grandchildren. It was a span of knowing people who had lived over the course of 152 years, from 1820 to 1972! My grandfather also had known seven generations of Robbins in his lifetime when he passed in 2003; people who had lived over a course of 159 years, from 1844 to 2003! My dad, at nearly three-quarters of a century old, has known seven generations of Robbins, too; even though his great-grandfather Robbins died before he was born, he knew his great-grandmother. I have known six generations of Robbins. And if I'm lucky, someday, I'll be a great-grandmother, and know Theo's children. Who knows how many generations Theo will know in his lifetime? In Pacific Northwest Native cultures, there is an inter-tribal value of "Seven Generations," in which the impact of decisions on the next seven generations is considered. As genealogists, have we considered how we are passing on the stories, photos, heirlooms, traditions, and culture that we have learned and inherited from the ancestors within memory to our descendants? How many generations have you known? He's adorable! Love the story. Glad to see there are still some storytellers blogging. My focus is on the people who have been a part of my life. Condoleza Rice wrote a book about her parents that she titled Extraordinary Ordinary People. That describes my parents, grandparents, aunts and uncles too. I want to make sure that their lives are more than a few dates and places. Thank you, Denise! We like to call him "Theodor-able"!